This outfit combines three of my favorite things: sequins, a casual knit top and a pair of my ultra feminine heels. For me, it's the perfect balance of casual and glamorous. We snapped these photos on Rodeo Drive just as the sun was setting. Sometimes all you need is a little bit of sparkle, right? Happy Wednesday! gorgeous skirt! How I love sequins too! You look beeaauutiful, love this casual take on sequins! I love the way you've dressed down the sequins! you look amazing! love the Zara skirt! Love the pop of sequins and the rings are so lovely. Gorgeous outfit! Love that you paired glitter with a casual jumper :). Great look, and love your rings! You're right, this outfit is the perfect combo of casual & glamorous -- a look you do SO WELL! :) That last pic of you is incredible -- you look stunning! Love this! Great outfir, the knit and the sequins! Thanks for commenting on my blog! Hope you're interested in following eachother perhaps on bloglovin! If you are, let me know when you follow so I can follow you right back! Glamorous combination, you look just perfect! Love the pop of sparkles :) I have this skirt too, it's so versatile! amazing combo - so classy! That skirt is awesome. And you're right, those rings are just perfect! I'd be obsessed. What a lovely outfit..ur so cute! following! care to follow back?? The sparkly skirt is so pretty! And I love your little rings...what a great flea market find! Love your skirt, very fancy! Hi shawty! I am Cecilia and i find your blog amazing! but I have a boredom. I joined Blogger for some time and I still have no members! Can you please join my blog? I really need it and I promises to become member of your blog also THANKS! Love the sequins with the casual comfy blouse! And those rings are so feminine and classic! Have a great day and thanks for stopping by Wrinkled Chiffon. Gorgeous! I'll have to try wearing my skirt this way. Thanks for the idea! You nailed it. AGAIN! Why are you so gorgeous? Inquiring minds want to know. I love the sweatshirt with the sequin mini and lace pumps. Seriously! Way sexier than if you'd worn a fancy top. You look so pretty Audrey! these pictures (and you) are beautiful! did you happen to pick up anything while on rodeo? Love this. The sparkles & sweater go great together. You look so stunning, love the sequins skirt and your shoes are to die for. So pretty! I love that you're wearing day time sequins! Such a beautiful skirt for a beautiful setting. I adore sequins. You look ultra chic and so glam Audrey! I love how you always manage to take something that would normally be "too dressy" but make it so cute & wearable! perfectly amazing!!! Love those combinations of a casual knit and a sequin skirt, that mis of styles is perfect!! And... I have to say... those rings are amazing!! That skirt is so snazzy and chic! Those shoes are simply perfect, so pretty and feminine. this combo is perfect, love that skirt!! i love the juxtaposition of glam and casual in this outfit! i think you nailed it. those rings are a great flea market find! Those rings make my heart melt. They're so simple yet so stunning! Beatuful look and your skirt is so cute. Amazing outfit, love the glitters!! I love the skirt combined with this dark knit shirt! Looks so chic! i completely forgot about my skirt:) Love how it looks with sweater and esp cause it's grey! can't go wrong with the black (dark gray heathered) and gold combo. i'm also a huge fan of the dainty little rings! must get some! It seems like forever since I had time to write a comment! My new site is finally up; hope you'll like it! I have been eying that skirt at Zara! It looks so cute with the sweater! absolutely dying over this outfit. i love how relaxed and high fashioned it looks!! It's a stunning look, i love it. Love the whole outfit!! 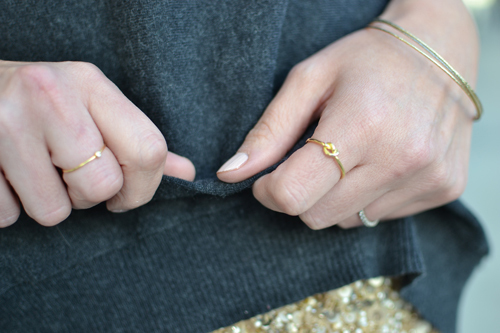 I've been really into dainty rings lately too! I love the glitter skirt! love that skirt! you look amazing!! Lovely shoes!!! Please take a closer pic of these shoes!!! I love how you are wearing that sweater over your skirt!! Amazing! !